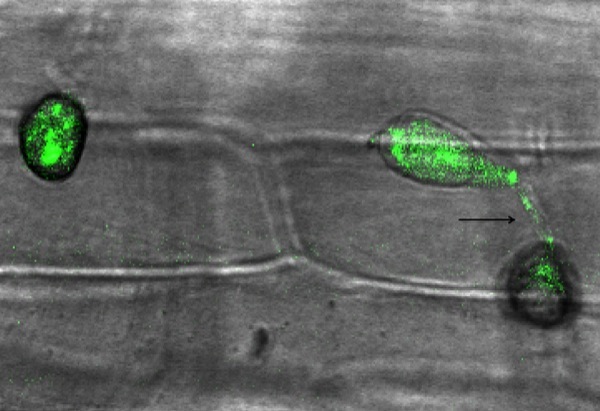 The rice blast fungus M. oryzae infects rice plants through a structure called an appressorium. It exerts pressure on the plant leaf until it punctures it. 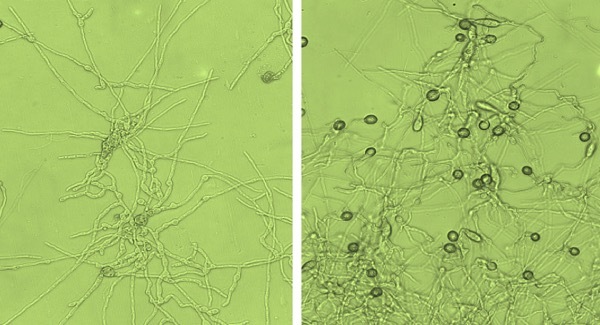 At left, the rice blast fungus develops specialized infection structures called appressoria. At right, the beneficial bacterium EA105 dramatically suppresses formation of these structures. Abscisic acid, added to M. oryzae, revives formation of the appressoria (right). 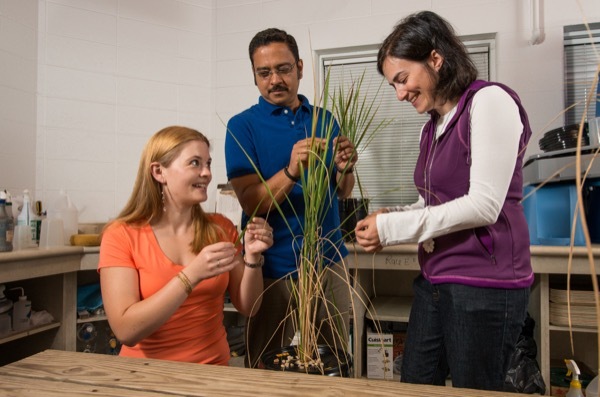 From left, the UD research team of Carla Stone, Harsh Bais and Nicole Donofrio is working to find a better method to control rice blast, a fungus that ravages rice plants. Postdoctoral researcher Venkatachalam Laksmanan, not present for the photo, also is a member of the team. 8:35 a.m., Dec. 22, 2015--In a “clash of the microbes,” University of Delaware plant scientists are uncovering more clues critical to disarming a fungus that is the number one killer of rice plants. The studies were led by the laboratory of Harsh Bais, associate professor of plant and soil sciences in UD’s College of Agriculture and Natural Resources. The first author of both research articles was graduate student Carla Spence. The co-authors included postdoctoral researcher Venkatachalam Laksmanan and Nicole Donofrio, associate professor of plant and soil sciences, in addition to Bais. 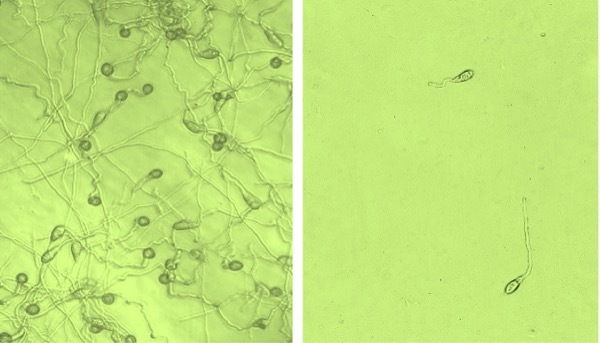 Bais and his team have shown that when the rice blast fungus invades a rice plant, an increase in abscisic acid occurs. But rather than boosting the plant’s defense mechanisms, the abscisic acid actually suppresses them, making the pathogen even more potent.